Companies have to innovate. It’s a creed most organizations agree with and so does Carglass, specialist in repairing windshields and damaged bodywork. To provide their customers with an even better and faster service, they introduced a new ERP system for their 850 employees. They reached out to INNOCOM to help them ensure a smooth roll-out. 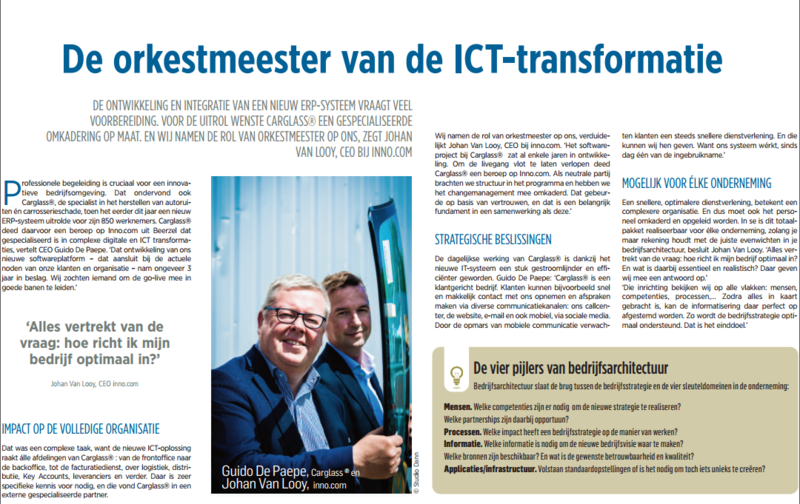 Our CEO Johan Van Looy and Carglass’ CEO Guide De Paepe talked about the project and the importance of innovation in an interview with leading business paper De Tijd. The introduction of the new ERP software would be no easy task, as every department would be impacted. Moreover, the platform would be the culmination of three years of hard work. Ensuring that the go-live went without a hitch was paramount, and this required specialized knowledge. Knowledge they found at INNOCOM, explain the two CEOs. Johan Van Looy and Guide De Paepe had much more to say about their partnership and innovation. You can read all about it in the article from De Tijd here.